Following on from my last post about the thinking about viruses as potential drivers of degeneration in MS, here is some initial data from our experiment of using Omegawash as a strong natural detox agent. 12 people have tried taking this strong natural herbal and colloidal detox product, which claims to be anit-viral as well as anti-bacterial. anti-fungal and anti-parasitic. I asked people to fill in the MSQOL 54, a quality of life score with many different elements, both before and after. Results: 1 person could not take it as it made them feel ill, & 1 for personal reasons; 1 I haven’t managed to follow up yet. 4 people took 1 bottle and did not notice any benefit or change, 2 of them have since had inflammatory activity and viral (coldsores etc) activity. 1 was in a very bad way when took 1 bottle as a ‘last resort’, with continual fatigue & very uncontrolled spasticity; this cleared up, although obviously, not cured of MS and its problems by any means, & MSQOL data has been lost. 4 people took a bottle, felt an improvement in their symptoms, and went on to supplement the 1 bottle funded by the MS Centre with 2 more bottles each. Because the most noticable theme in people who felt they benefitted was an improvement in energy, this is the item I have looked at first. All of these 4 participants felt that the omegawash had made a significant difference to their energy levels. One of these had also made other changes over the same time period, starting hyperbaric oxygen, and changing her diet. I have only just started to look at the questionnaire data. I will report on this again once I have chased up my last participant, and looked at the other areas of the MSQOL, and identified any unifying factors in the people who reported benefit. Today I could say that out of our tiny 10, there was a 10% drop-out rate, 40% no benefit, 10% possible benefit, and 40% reported significant benefits in energy ( and other areas of quality of life which I have yet to analyse). In the ‘responders’ group, there was an average of 39.5 point improvement in energy. Other reported benefits not included in the MSQOL included complete alleviation of bloating and vaginal thrush. In the interests of science (haha! ),’more research is needed’; but in the interests of ‘doing what you can asap as long as it’s not dangerous’, I thought I’d just let you know! Omegawash is available from www.omegawash.co.uk. As with all herbal products, you need to check that the ingredients are safe for you to use with your condition and whatever medications you take. MS Trust conference – part 1. In November I attended the MS Trust’s annual conference for healthcare professionals working in the field of MS. I really enjoyed this year’s conference, and will summarise what I learned below. The first speaker was Gavin Giovanonni, top MS researcher at Royal London Hospital. This is a pic from his blog, which you can follow at http://multiple-sclerosis-research.blogspot.co.uk/ http://multiple-sclerosis-research.blogspot.co.uk/. It includes ‘the mouse doctor’ (?) who is co-blogger. ‘Will the real MS please stand up?’ by Peter K. Stys, Gerald W. Zamponi, Jan van Minnen & Jeroen J. G. Geurts – here’s a link to the full text article http://mssociety.ca/chapters/calgary/pdf/2012_Stys_507.pdf. This article weighs heavily on the side of looking at the importance of degeneration, so doesn’t really discuss the benefits of early aggressive treatment of inflammation. Giovannonni’s blog calls this article ‘myopic ramblings’ ; it’s a dog-eat-dog world out there in academia, but Peter Stys has received funding from the MS Society of Canada to research progressive MS, which has got to be good news. 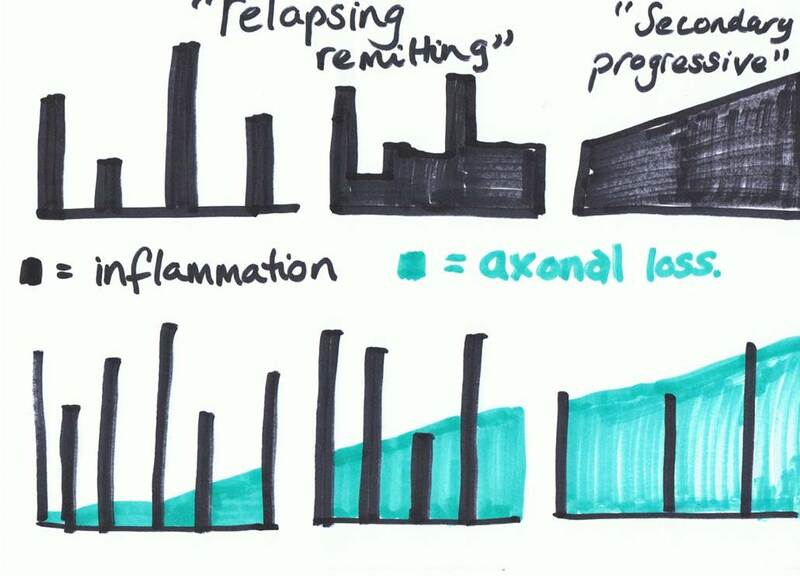 Basically, the tall skyscrapers represent inflammation – relapses or new symptoms. They are the part of MS that pretty much all the research and medications for MS have always been aimed at; that’s why research trials always only want to recruit people with relapsing –remitting MS. But the disappointment over the last few years has been realising that although the disease modifying MS drugs can show a reduction in relapses, they have not been able to prove a reduction in the progression of MS. The progressive element of MS is represented by the green block, and represents damage to and loss of axons, the long part of the neurons, or nerve cells. The argument that Giovannonni presented, which is being mirrored by various thinkers around the world at present, is that perhaps research/pharmaceuticals have been focussing on the wrong part of MS. Perhaps the periods of inflammation in MS are the body’s reaction to a degenerative process that is going on. As in this article, Giovanonni described his team’s interest in HERVs ( human entero-retrograde viruses – virus which are within the genes) and other virus which we can contract later in life; in particular, the Epstein Barr virus which causes glandular fever, and is part of the Herpes virus family. They want to see whether by suppressing these viruses, the driving force of the degenerative process might be taken out, and they have just received funding to do the preliminary research with anti-virals, which is great news. It made me think again about looking into powerful natural anit-virals, and I’m going to speak to all the people who tried using some last spring to hear about experiences and see how they’ve been doing since. The professor warned us that this would be a challenging session, and it was. This is really important, as high dose vitamin D has become a mainstay of treatment for anyone who’s had their ear to the ground in the last few years, and neurologists have started to also take it seriously and recommend it. She introduced us to all the formative research on vitamin D and MS; the Nurse’s study, which is scientifically important and excellent due to the enormous size of the sample – 92,253 women followed from 1980 to 2000) and Nurses’ Health Study II (NHS II; 95,310 women followed from 1991 to 2001. This study showed that having higher vitamin D blood levels, and taking supplements containing vitamin D had a strong effect of protecting a person from developing MS. The US army study; likewise, great numbers and scope of years, showing 7 million army recruits from 1992-2004 and compared the vitamin D levels with their risk of developing MS.18 They found 257 new cases of MS in the group. There was a significant decrease in risk with increasing vitamin D levels among white, but not black or Hispanic people, who had lower vitamin D levels than whites. Levels of around 100nmol/L or more seemed to be protective, with almost a two thirds reduction in risk for those with these higher levels. She then gave feedback on 4 or 5 more recent studies, where vitamin D supplementation ( mostly D3 but one study used D2) was given at various doses, over various timescales, none of which showed any influence on annual relapse rate, or level of disability at all. We then went on to discuss what to make of this? For example, low levels of vitamin D in the blood are associated with relapses in MS – but maybe they do not go towards causing it – maybe the low level of vitamin D is caused by the relapse or inflammation? One point was that it may not be possible to extract the active ingredient – whatever that is – from the foods in order to make an effective supplement, and that sometimes other helpful substances in foods are responsible for the absorption of a nutrient. I asked whether there was a difference between getting your vitamin D from the action of sunlight on the skin and a supplement? I didn’t get the full answer I was looking for, but Prof Young did make the point that there are other actions that the sun has on the immune system and inflammation that are generally beneficial. People wanted to know what we should advise ‘while the scientists work it out’. Prof Young’s advice was that she felt that 1000IU should be the top recommendation a healthcare professional makes to a person with MS, and that it chould be checked that the person doesn’t have any kidney problems, as if they do, high dose vit D could cause kidney stones. I’m going to ask Giovannonni on his blog/twitter/whatever what his response to this is, and also check what George Jelinek has been making of it. I think if I have any thoughts on this so far, they are that perhaps people with MS need to try to get a s much Vit D as possible from foods and from the action of sunlight on the skin. 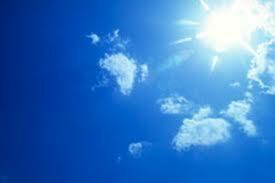 In this country that only works between April and October, and when the sun is high in the sky. It makes me wonder about sunbeds, I haven’t gone right into this, but just asking around, apparently you can get vitamin d from using a sunbed, but it has to put out UVB rays. I think I’m probably going to carry on recommending 5000IU, due to all the other research I’ve seen, but will be keeping my ear to the ground. I’ve got more from the conference and will post as soon as I get time to write it up! 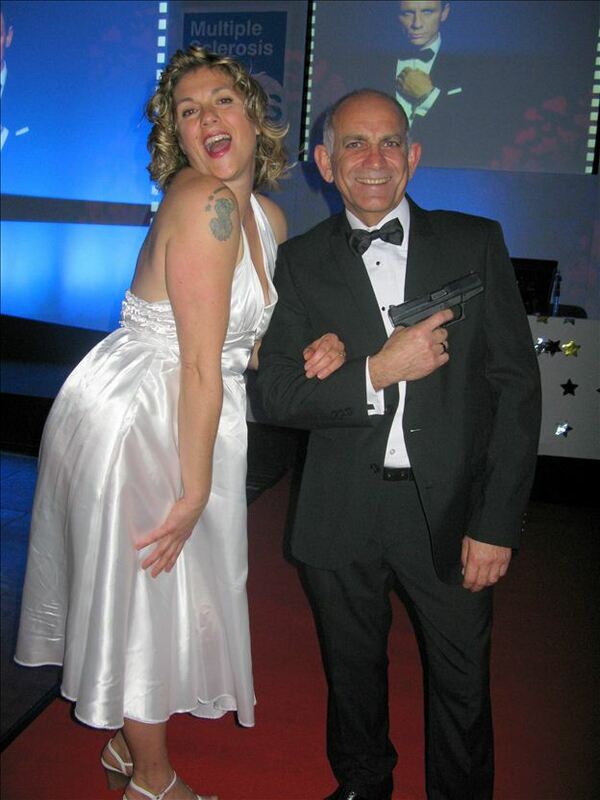 We also had a great time at the gala dinner fancy dress night, so In the meantime, this is for the Bedfordshire people – if you ever wondered whether your MS nurses were arch rivals or accomplices in crime, here’s something to confuse you further….! but I did enjoy being Marylin for the night!